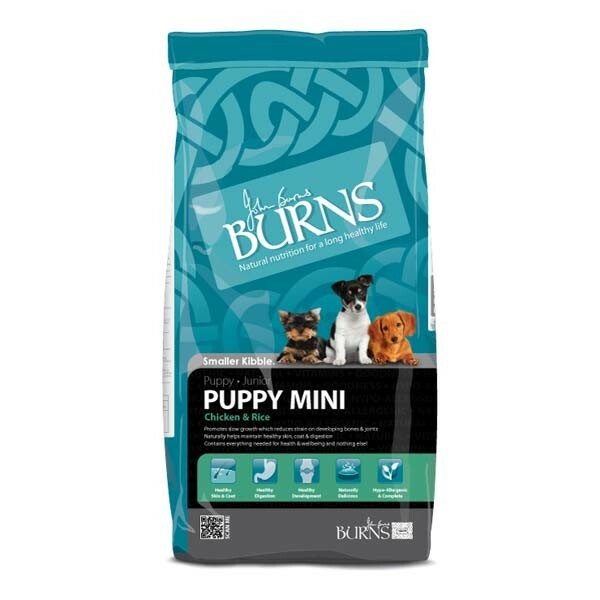 Burns Mini Bites is a complete hypoallergenic puppy food suitable for all growing puppies, toy adult breeds, pregnant, nursing or underweight dogs that contains no dairy, wheat, wheat gluten, soya or beef and contains 21% protein, made with chickens from non battery farms. Burns mini bites puppy food is suitable for puppies from 3 weeks of age and is naturally preserved like all burns varieties and contains no artificial colours, flavours, cheap fillers or animal derivatives. Like all burns dog food's, the mini bites recipe contains a controlled level of protein, fat and essential minerals to ensure your puppy or adult toy dog is supplied with the correct level of energy for muscle and bone development, as too much protein to a growing puppy can cause obesity, skeletal disorders and conditions such as hip dysplasia. Burns mini bites has been formulated using the same holistic principles used to develop the other adult and high energy varieties, to naturally maintain and boost your puppy's immune system, promote a healthy skin and glossy coat, help protect the digestive tract and support the skeletal, respiratory and nervous systems of your puppy or toy dog to keep them fit and healthy!